=Maggie sensei, repouto wa konshuu juuni teishutsu sureba iidesu ka? =Iie, asu no hachiji juunanafun kikkari ni motte kite! Hi everyone! Today I will teach you time related vocabulary. You simply put 毎 ( = mai) on top. Maggie goes to Hawaii every year. =Isshuukan oki i piano wo narai ni itteiru. 隔(=kaku) is usually for written Japanese. (Except 隔週 ( = kakushuu) as I showed in the above example.) So if we want to say “every other day” we use 一日おきに ( = ichinichi oki ni) more than 隔日 ( = kaku jitsu) in conversation. ★*How do you say “next ~“? You put “来”( = rai) in front of the time unit. Ex. 先日はお世話になりました。(Senjitsu wa osewa ni narimashita.) Thank you for taking care of me / helping me the other day. ★*How do you say once (or twice) a year/month/day? ★*How do you say “for ~ days/weeks/months”? You add “間” ( ＝ kan) after the number. Even if you can count all the numbers in Japanese ex. ichi, ni, san,etc, you may have a little trouble remembering how to count a day or refering certain dates. For example, May 4th is not “gogatsu yon-nichi”. It is “gogatsu yokka”. =Toukyou ni mikka kan taizai shimasu. Here are some more examples of how to read the dates. Note: When you count a day, you don’t use tsuitachi. You use ichinichi. You add “ヶ月” ( = kagetsu)in the end. OK, here are the basic units. ★ * How do you say “~ ago“? You add “前” ( = mae) in the end. • ２ヶ月前 ( = nikagetsu mae) : two months ago. ★* How about “~ later” or “after ~“? You put “後 ” ( = go) in the end. ★ * How do you say “~end of (mohth, year)? You put “末” ( = matsu) in the end. (お)正月休み( = (o)shougatsu yasumi) New Year’s holidays. =Natsuyasumi ni haittara dokoni ikimasu ka? Where are you going in summer vacation? =Shougatsu yasumi ni sukii ni ikimashita. I went skiing during the New Year’s holiday. =Kyou wa nanyoubi desu ka? = What day is today? =Kyou wa nannichi desu ka? = What’s the date today? =Kyou wa hachigatsu juugonichi desu. =Kyou wa ichigatsu muika suiyoubi desu. = It’s January 6th, Wednesday. = Do you have some time now? =Ie, mou jikan ga arimasen. = No, I don’t have any time left. • 午後 ( = gogo) in the afternoon P.M.、午前 ( = gozen) in the morning A.M.
= Sakuban wa hiemashita ne. = Kesa nani wo tabemashita ka? = What time is it now? =hachiji jippun (juppun) mae desu. = It’s 10 minutes before eight. = It’s just four o’clock sharp. Note : In Japan, it is very common to use 13:00~24:00 for the time table instead of 1:00 P.M ~ 12:00 A.M.
* What particle do we need to use when we say “at +number+ o’clock”? Usually we use “に” ( = ni). = What time shall we meet tomorrow? = Let’s get together at 7 o’clock! = Let’s meet around nine. = Sakuya niji yonjyuppu ni toukyou de jishin ga arimashita. = There was an earthquake at 2:40 last night. in Tokyo. =Hachiji ni yakusoku ga arimasu. = I have an appointment (an engagement) at 8:00 tomorrow. =Kuji ni yotei ga haitte imasu. = I have plans for 9:00 tomorrow. Also there is a lesson on particles with time related expressions. Time related Expressions with and without particles. • 早い ( = hayai)　early まだ早い（です） ( = mada hayai (desu)) It is still early. Ex. 彼は、朝早く出かけた。 ( = Kare wa asa hayaku dekaketa) He left early in the morning. Ex. もう遅い（です） ( = mou osoi( desu)) It is already late. = Winter is coming soon. = Let’s get together in spring. •今週中 ( = konnshuu chuu): sometime within the weekbefore the week is over. •きっかり ( = kikkari) = 丁度（ちょうど）( = choudo) : just, on the dot, sharp. Note : You can also use it for money. Note: If you want to learn “what particle you need/you don’t need with time expressions” go check this lesson. →Time Expressions with and without a particle. It ended up a long lesson again today. But plese come back here tomorrow, the day after tomorrow…well, every day to study! Thanks again for all your wonderful lessons! ^^ I'll keep studying hard! Thank you for all your “thank you”! Yes, you say 前日 = ぜんじつ= the day before. = Paatii no zenjitsu wa junbi ga taihen desu. = There are lots of things to do the day before the party. Hi thank you very much for this it is very informative :)) byw what is EVERY NOON? まいひる? Some people use the word 毎昼 but compare to 毎朝・毎晩 it is not so common. You can say 毎日、昼に〜do something. Since 1990, Apple was made iphone. Check my time expressions with/without time expressions lesson. How would you say ” for 2 years and 3 weeks” ? Could you help me with the okurigana please ? Oh, thank you for your reply ;). It’s 2016 now so you will come to Japan in 2017. 翌年 is used in past tense. You mention one past event first and then add what happened in the following year. = I went to Japan in 2010. I didn’t go anywhere in the following year. You can mention two actions. one action →翌年→the other actions. = I went to Japan the year after the graduation (year). How about I have sixth period (in school) period is　６校時 or 6 時間. But what is “have” for teacher or students? Wow, there were great many expressions that were new for me, thanks a lot! I have only one question which I haven’t found the answer for in the post. If I would like to say, for example, that “The package is going to arrive on the 4th day”, do I need to put に after 四日目, like there is “on” in the English version: “on the 4th day”, or not? I have learnt that when a time expression contains any number, we usually put に after it, but I’m not sure here. If you are interested in particles with time related word, go check this lesson. Hi, Maggie-sensei! I love your website, it’s so helpful. How would I say something like “I’m going to Japan in January”? Glad to hear you find my site helpful! I’m going to Japan in January. = 一月に日本へ行きます。= いちがつににほんへいきます。= Ichigatsu ni nihon e ikimasu. Great resource you created, hontou ni. Just one shitsumon: how do you say “I have been in Japan many times”? and “I have been in Japan more than 10 times” ? I have been in Japan many times”? If I want to say end of July, can I say ７月末？　which will read as しちがつまつ. If 2000年前 means 2000 years ago, then how to say “before 2000” (e.g: 1999, 1900). I learn a lot from this website. 1) 部屋を出るとき電気を消します I turn off the light when I leave a(the) room. 2) 部屋に入ったとき電気をつけます I will turn on the light when/once/ if I enter a(the) room. I don’t know if I understand your question but the tense of the verbs in 1) and 2) are different. 1) says what you do habitually when you leave a room. 2) says I don’t know when but when I enter the room, I will turn on the light. 2) 去年日本へ行ったとき京都へ行きました isn’t so difficult. It simply state what you did when you went to Japan. I visited Kyoto when I went to Japan last year. how would you say “It’s been X minutes/hours/days/weeks/months/years since”. On that note, how would you say “several” or “a few” minutes/hours/days etc. instead of using an exact number? And is there a way to simply say, “It’s been a while since [I last did something]”? Sorry for using English–I’ve only been learning Japanese for around three months. Thank you as always for your help!! “It’s been a while since [I last did something]”? How do you say “… days to go”? Hmmmm we usually use 数ヶ月 for a couple of months. If you see someone using 数月 somewhere, give me a link. I will take a look. Sensei, T-T Can you explain in detail about the time difference for mayonaka and yonaka? I read online that mayonaka should not be used as 12am as in midnight. And there is this word shinya as well. Sorry I can’t explain from what time to what time is which one but the most general word for the middle of the night is 夜中. Technically 真夜中 is midnight but 深夜(=shinya) and 真夜中(mayonaka) are both used as middle of the night. Thanks for your reply, Sensei. So basically you mean mayonaka can be used for both midnight and middle of the night? Ok, between mayonaka and yonaka which one is later in the night? Can I just summarized as in mayonaka is 12am and yonaka as in after 12am? 真夜中 has a meaning as “midnight” but usually we used it for no specific time and use it as “middle of the night”. Let me see if I can explain the concept in a more graphic way. I wonder how to say things like “eight hours a day”, “24/7”, “two days a week/month”, “three months a year”. Do you have a lesson for these? It’s means ‘period’ What’s the difference? watashino shashin wa donko desu ka? wow!!! so detailed and clear – I LOVED IT!!! you should make a quiz out of this on twitter! 今は午後10時5分前です。 It is 5 minutes to 10. 今は午後10時5分過ぎです。 It is 5 past 10. The both sentences are perfect! Watashi no bokokugo ha furansugo desu. Furansu go mo Furansu mo daaaaisuki! 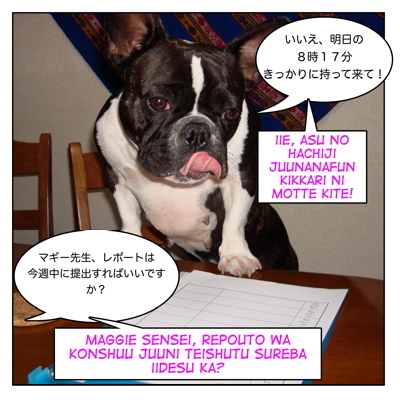 Maggie no bokokugo wa inu-go desu! Yukari (Maggie no assistant) no bokokugo wa nihongo desu. Okinasai no video mite kurete arigatou! Ibiki ga sugoi desho! By the way, sorry if my english sounds wrong too, I hope it’s still comprehensible. Kinou lesson wo keshite shimatta node comment mo kiechatte gomennasai! You made a great sentence. May I correct just a bit? Itsumo kono blog ni kite kurete hontou ni arigatou!! Tottemo ureshii desu! If you say 二日おきに、does it have the same meaning as 一日ごとに? I take computer lessons every two days. So technically “mikka goto ni” has the same pace as “futsuka oki” ni. “goto” is one unit that the number indicates. Oki’s kanji is 置き. (置く= to place, to put)　So you leave the number of the time unit in between. Thank you! Your questions always make me think. I will talk to other Japanese doggies about it. This is very useful information! Might I request you add the word for “weekend” (週末) into the lesson? That’s riiiight! I can’t believe I missed that one. I have just added it now. 助かりました。ありがとう！(=Tasukarimashita. Arigatou) Thank you for your help!